One in three new build properties outside London were bought through a flagship scheme for first-time buyers, but just one in 10 in the capital, analysis by BBC News shows. The Help to Buy Equity Loan was introduced to boost the housing market. A property expert said the scheme has had "little success" in London, where in some cases, loans of up to £190,000 have been taken up. The government said it has helped buy more than 100,000 homes across England. Help to Buy loans were used to purchase 76,559 homes outside of London between April 2013 and April 2016. This is equivalent to 30% of the 255,960 privately built new properties completed in that period. In London, there were 4,483 completions using equity loans, equivalent to 11% of the 41,480 privately built homes over the same time. Taking all households into account fewer than one in every 500 London homes has a Help to Buy loan, compared with one in every 200 elsewhere in England. There was a surge in uptake of the loans in Greater London since February, when the government increased the upper limit for new home-buyers in the capital from 20% to 40% of the property's value. Just 10 equity loans had been taken in the London borough of Hammersmith and Fulham by October 2016 since their introduction in 2013, receiving £1.9m between them, or an average of £190,000 each. Six of Hammersmith's 10 buyers were helped between June and September 2016 alone, suggesting the rise in the upper limit made a difference. In Kensington and Chelsea, the most expensive place to buy a home, the only two loans taken were worth a combined £360,000. The highest number of loans taken per head of population was in Bedford, where the 1,268 loans was equivalent to two in every 100 households. Between them, the loans came to £62.9 million, or £49,416.68 each. The average loan for England, including London was £46,301.03. The rate of take-up has been significantly less in London compared with the rest of England. Property agent and housing market commentator Henry Pryor warned there could be a "severe hangover" once the subsidies of Help to Buy are removed. He said: "The (HTB) initiatives have been more helpful away from the South East, where prices are lower. Clearly, there is less practical opportunity in London which is one reason why the numbers here are so small. Even the capital's own version (with a higher upper loan limit of 40%) has had little success. He said the schemes had "clearly helped politically and practically" but added: "The question is whether the government can wean lenders and developers off the financial drug that it has become addicted to. "Watching commercial businesses [house builders and developers] get fat on taxpayer subsidies is not something that can or perhaps should last for ever. "At some stage, we will need to 'remove the punchbowl' and when that happens, the hangover may be severe." Roger Harding, Shelter's director of communications, policy and campaigns, said: "While a Help To Buy equity loan might help some first-time buyers on to the ladder, in the short-term there is a risk it will push up house prices making it even tougher for others to buy a home in the future. "If the government really wants to tackle our housing shortage, its best bet is to start with building homes that are genuinely affordable for people on low to average incomes to buy and rent long-term." House builders say the equity loan scheme has helped first-time buyers who would not otherwise have been able to afford a home. Gavin Stewart, sales director at Barratt London, said it had proved an "effective way for many Londoners to get on the property ladder". 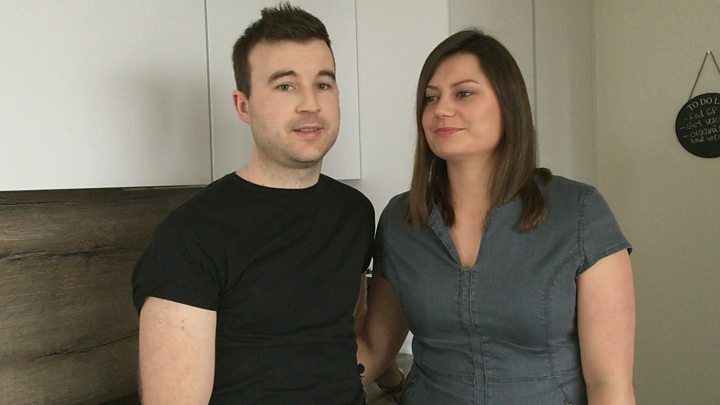 Luke Smith and Barbara Antkowiak, who bought a Barratt London property in Hendon with a Help to Buy loan, say it means they spend less than they would on rent. Mr Smith said: "We're hoping that by the time we come to pay it off the house will have gained enough in equity." A DCLG spokeswoman said: "Help to Buy: Equity Loan has helped more than 100,000 households get on the housing ladder since it was launched in 2013. "It is one of a number of housing schemes provided by the government, so people have a choice of what is right for them." There was little evidence the scheme was increasing house prices, she added. The department said London Help to Buy was "performing strongly" and has seen take up in the capital double since its launch in February 2016. How does a Help to Buy Isa work?